Access. PGE regularly closes the dam for maintenance and operations. 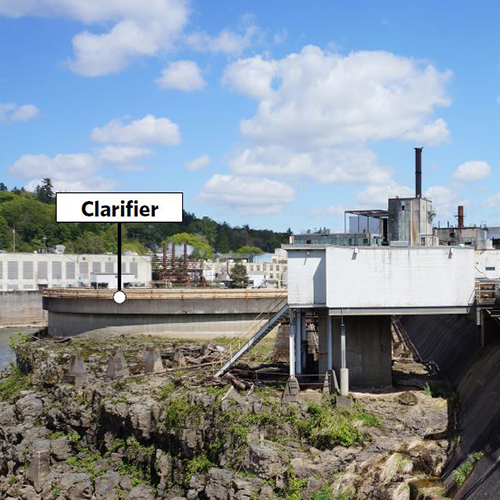 The clarifier could potentially provide a secondary means of accessing the falls overlook. Healthy Habitat. The clarifier could be removed (fully or partially), to restore and protect sensitive riparian basalt habitat areas. Use. The clarifier could support different activities and become a destination on the walk to the falls. Remove the clarifier for habitat restoration. A portion of the back wall is retained as a nod to the industrial artifact. 2. 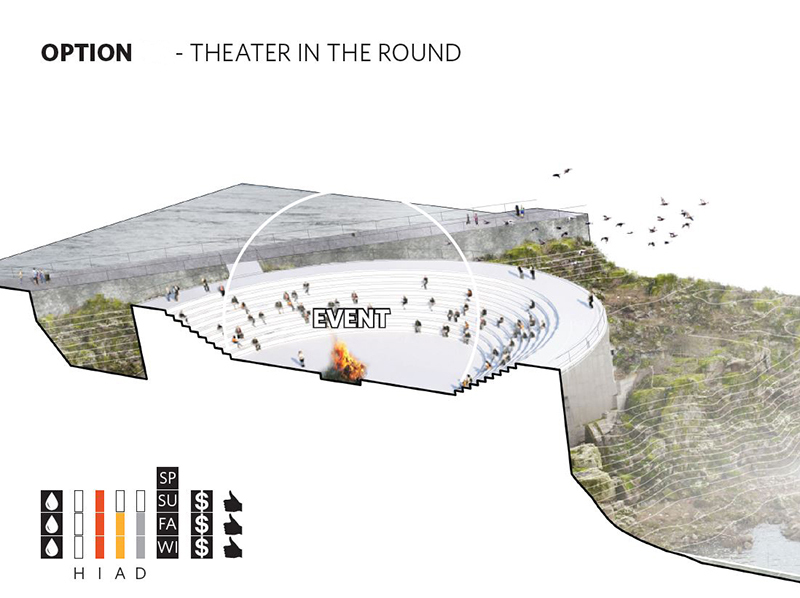 Leave the clarifier intact as a event space, such as a theater in the round. 3. Create an attraction on the clarifier. This option proposes a temporal way to create a spectacle with a hot air balloon. 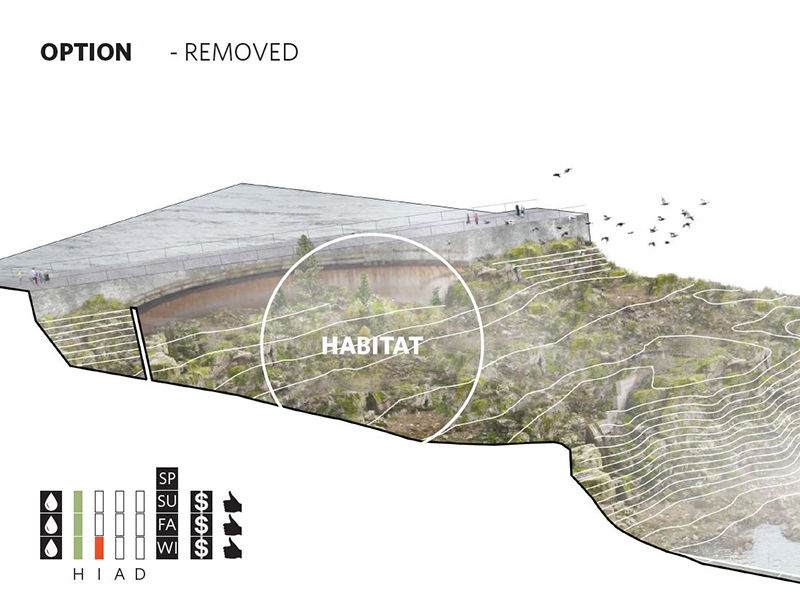 This would give visitors a way to get up high so they could see views both upriver and downriver within the context of the watershed and Oregon City. 4. Leave the clarifier intact, filling it in with soil to create a planter. The circular perimeter pathways provide an alternate connection to the falls overlook. 5. Similar to the last option, create a landform within the clarifier. 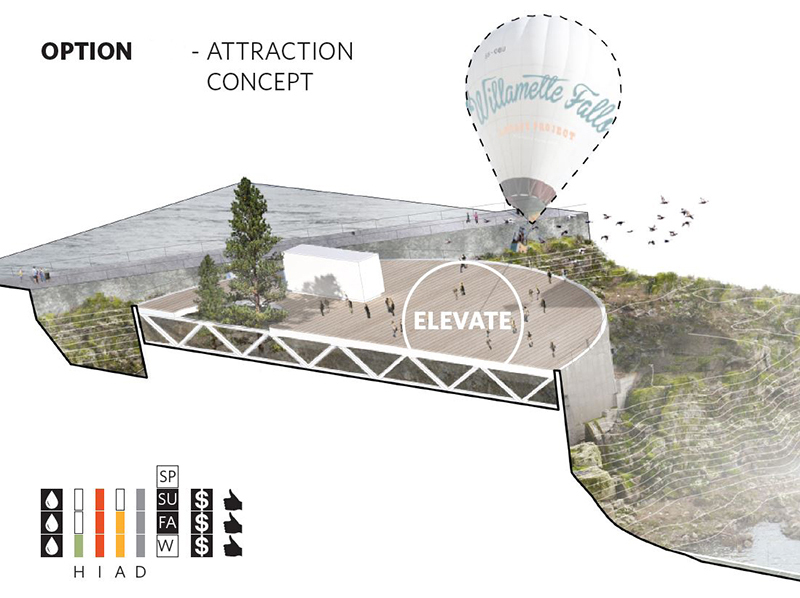 This could elevate the visitors' perspective of the falls and river. There is a potential to add plantings to the back side of the landform gathering space. 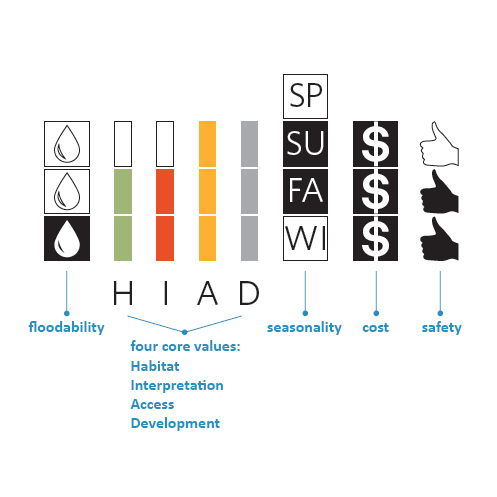 Moving forward, these options can be combined, modified and hybridized to craft the preferred riverwalk design. Our design team will consider community feedback along with technical information such as flood impacts, structural integrity and costs. The feedback received at the event and on the online survey showed strong support for the event space and landform options. There were mixed opinions on keeping versus removing the clarifier. Some consider it an iconic element. Most consider it part of the site’s history and support keeping at least portions of the structure. 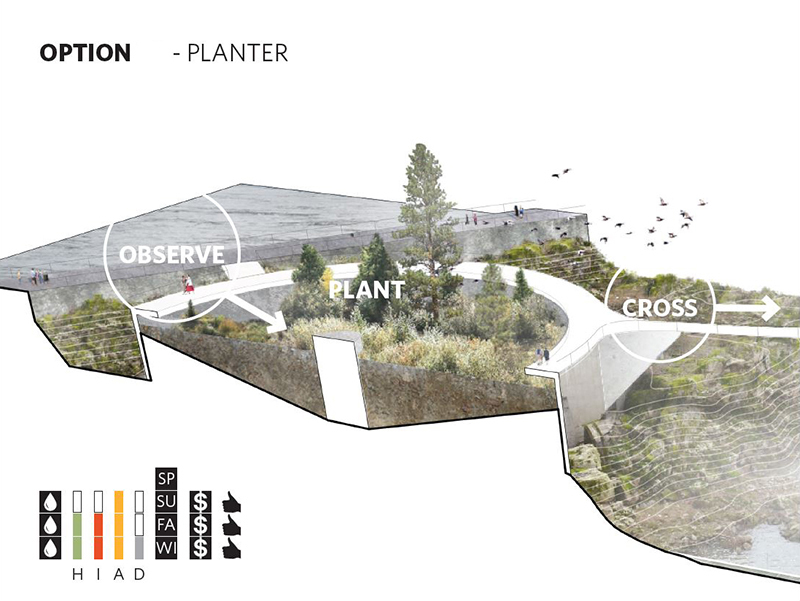 As with other site areas, there was much support for using natural materials (stone, greenery) mixed with industrial materials (salvaged materials, clarifier relics). In contrast, some who supported the event space option suggested a place in stark contrast with the surrounding environment, including suggestions such as a glass atrium and dome covering. There was support for habitat restoration and supporting native ecosystems. Some liked the landform concept for this reason, whereas others wondered whether the landform was natural. Many indicated a desire for views from the clarifier. For the theater, some suggested removing portions to allow views. For the landform, some liked that it provided views, whereas others worried it could block views from elsewhere. 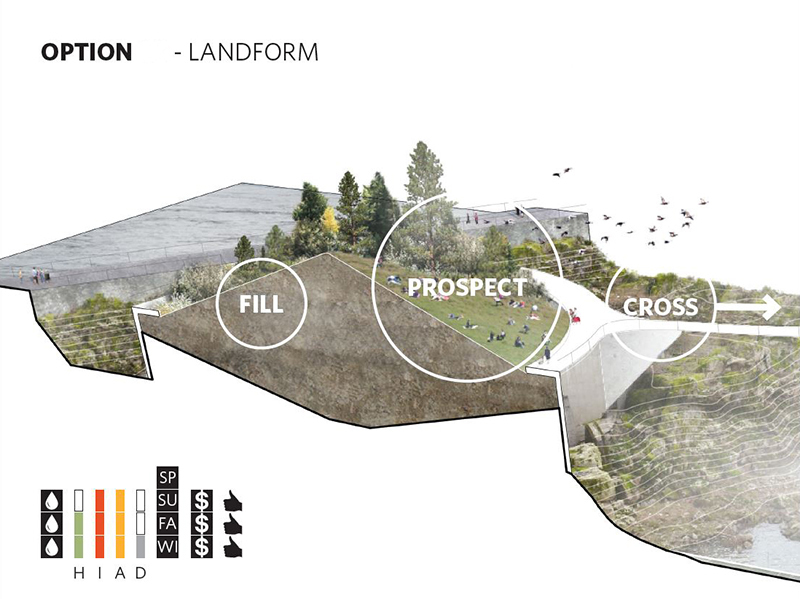 A wide range of uses were suggested for the clarifier site – skate park, ice skating rink, lap pool, bungee, play area, aquarium, pocket park – indicating a desire for it to be a community space. If the clarifier becomes a theater or event space, noise should be considered. For full results of the survey and event workshop, see the report here. Take our online design survey here.